Love your Blog. I\'ve just stumbled across it and will be back for more. Travel Photography was my first passion and it\'s great to find a site dedicated to showing us the world. I love you site and this picture is wonderfull. Sorry for my english but i didn\'t resist to say you thanks! Fantastic colours, this is a beautiful image. 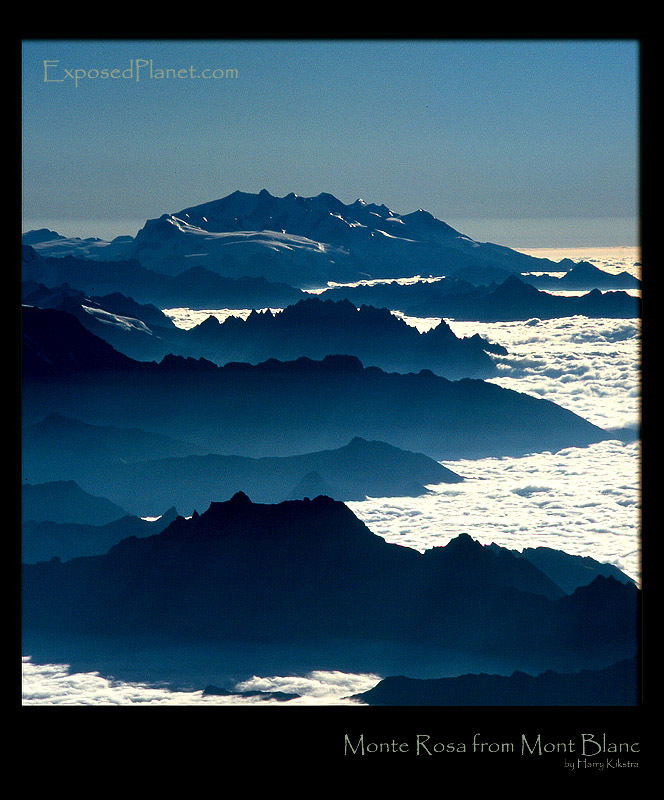 The story behind "Monte Rosa from Mont Blanc, Alps"
When summiting Mt Blanc, we saw the sea of clouds as published earlier. But when looking east, we could see across Italy, towards the Monte Rosa group. The rising sun cast different shades of shadows across the ranges creating a surreal effect. One of the best things about climbing mountains that you get to see the world from different angles and perspectives.. Shot with EOS 3, 75-300mm zoom lens on provia slide in 2003, scanned later.